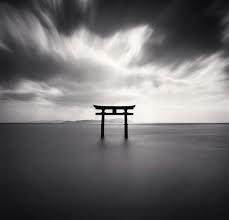 I'm using Nikon D750, and intend to take a ultra long exposure picture such as this (by Michael Kenna). What's is the reasonable shutter speed and aperture for that? If I use shutter speed 2 hr what is the right aperture for that? f/22 is it still to high? Let's assume this photo was taken in bright daylight. To properly expose in daylight at ISO 100 we would use something like f/16 and 1/125 second. To expose for 2 hours is 7,200 seconds! That's between 19 and 20 stops difference from 1/125. By using f/32 we would make up two of those stops, so we would still need about 17-18 stops of neutral density. We'd also be dealing with the issue of image softening diffraction at f/32. That's assuming you are shooting digital and don't need to worry about reciprocity failure a/k/a the Schwarzschild effect. Exactly how much compensation must be made when using film will depend on the characteristics of the specific film one uses. Manufacturers usually publish long exposure data for their films, but that data does not usually extend to such long exposure times as several hours. Manufacturers data charts also assume a relatively bright scene, not midnight on a cloudy, moonless night. Remember, film, unlike a digital sensor, is "always on" until it is developed. But when proper temperature is maintained, it can sit for months or even years in total darkness before its ability to properly record a short burst of bright light as intended is compromised. Ultimately it is the total amount of light absorbed by a film that leads to reciprocity failure, not the total time the camera's shutter is open. If the camera is in a light proof box or room, the shutter can be open indefinitely without affecting the film's sensitivity to a specific amount of light when it is ultimately exposed to light. Trial and error and experience play a large part in such work. I'm guessing this photo was actually taken under moonlight that is exposed so bright that it appears to be during the day. The brightness of the moon varies greatly depending on the angle in the sky and atmospheric conditions. Light meters, particularly those built into cameras, aren't very good at measuring such dimly lit landscapes accurately. One advantage of using film to create such images is the reciprocity failure allows longer exposures with less total neutral density needed. Another is that films much slower than the base ISO of most digital cameras are available. Due to the heat buildup in a digital sensor over a period of two hours, it would be very difficult to create such clean images using digital cameras. Looking up some information on Kenna seems to confirm this. "There are many characteristics associated with night photography that make it fascinating. We are used to working with a single light source, the sun, so multiple lights that come from an assortment of directions can be quite surreal, and theatrical. Drama is usually increased with the resulting deep shadows from artificial lights. These shadows can invite us to imagine what is hidden. I particularly like what happens with long exposures, for example, moving clouds produce unique areas of interesting density in the sky, stars and planes produce white lines, rough water transforms into ice or mist, etc. Film can accumulate light and record events that our eyes are incapable of seeing. The aspect of unpredictability inherent with night exposures can also be a good antidote for previsualization. I find it helps with jet lag too! Indeed my first night photograph, made in 1977 of a set of swings in upstate New York, was a direct consequence of not being able to sleep. At the time I used the "empirical method" of exposure measurement, (i.e. trial and error), with much bracketing. The results were very interesting and since then I've worked on my technique a little." He does not, however, seem to speak very openly about the specifics of that shooting technique. He seems to be a bit more forthcoming regarding his approach in the darkroom. In the video linked from the above bio, he appears to be using a medium format film camera in the scenes that show him with his camera and tripod moving through the night. In this video, we see him shooting more during the day, but under dim winter skies. At 15:10 we see that he has a red/orange filter in front of the lens for that particular shoot. At 21:46 he discusses the importance of working in the darkroom to "sculpt" the image into what he wants. Based in all that I read in preparing this answer, as well as on the actual image, I'd be surprised if this one was exposed for more than 15-30 minutes at the most. Michael Kenna is one of my favourite photographers. You should probably read this interview with him. How did you arrive at a shutter speed of 2 hours? Did you just pluck it out of the sky? I've said it before - photography is the art for mathematicians. You need to calculate your shutter speed; you can't just pick one at random. Do you understand the exposure triangle? If not, that's where to start. Basically, "correct" exposure can be represented as one fixed value. You then need to (mathematically) choose a combination of aperture, shutter speed, ISO and ND filter to achieve this exposure value. One significant difference between Michael Kenna's approach and yours is that he is shooting on film - specifically traditional black & white film, and more specifically Kodak Tri-X (probably). Film has a reciprocity failure effect, which effectively means that for very long exposures, you don't have to be as exact when it comes to avoiding overexposure. Or to look at it another way, reciprocity failure works to your advantage if you are trying to use a very long exposure time. There is no reciprocity failure effect with digital. Another significant aspect of Michael Kenna's photography is that the "look" has an awful lot to do with how the negative is printed in the darkroom. Another photographer who does similar work (and who I believe worked directly with Michael Kenna in the past) is Rolfe Horn. It's worth going through the examples on his website showing the steps he took when printing some negatives. If you just want to experiment with long exposure, then, as mentioned by Corey in the comments, you can get some very nice effects with shutter speeds far shorter than 2 hours. So, go experiment! Watch the clouds - their speed and direction - while you expose. Take notes and compare them to your results. You'll probably start to see blurring with just a few seconds of exposure (again, depending on cloud speed and direction). Keep doubling your exposure time until you acheive the desired results. Fun! How can I get long exposure for star photography with a Nikon Coolpix P900?